Aprenda os segredos da família real nesta excursão de 4 a 5 horas do Palácio de Gödöllo, a residência de verão do Imperador Franz Joseph I e da amada Rainha Húngara Elisabeth. Partindo de Budapeste, um guia o levará 30 minutos a nordeste para explorar este esplêndido castelo barroco. Em seguida, pare em uma autêntica fazenda húngara para provar palinka, uma famosa aguardente de frutas nativa da Hungria, e scones salgados antes de desfrutar de um passeio de carruagem. 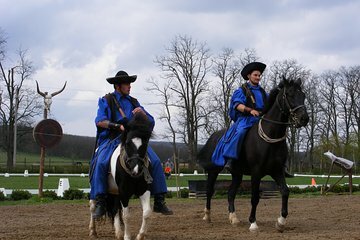 Sua excursão será concluída com um show equestre e transporte de volta ao seu hotel em Budapeste. Sua visita guiada começará em seu hotel em Budapeste, onde você será levado e dirigido 30 minutos a nordeste pela zona rural húngara. Você chegará ao Palácio de Gödöllo, o opulento castelo que abrigou a rainha húngara Elisabeth, também conhecida como Sisi, e seu marido, Franz Joseph I, o imperador dos Habsburgos. Com jardins deslumbrantes em torno da propriedade, o castelo foi apresentado como presente para o casal, que visitou sazonalmente. Faça um tour pela paisagem exterior antes de viajar para dentro para ver a suíte privativa do Grand Hall e Sisi, adornada em seu tom favorito de roxo. Seu guia irá narrar a história por trás do prédio, junto com os contos de juicer dos amantes secretos do casal e portas escondidas. Você também aprenderá sobre os ardentes interesses equestres da rainha. Em seguida, viaje pelo interior idílico até uma autêntica fazenda húngara. Você receberá um copo da famosa aguardente de ameixa da Hungria, palinka, no momento da chegada, bem como pogácsa, deliciosos scones salgados tradicionais da região. Em seguida, faça um passeio em uma carruagem puxada por cavalos para ver as trilhas e os campos ao redor da propriedade. Depois, você terá um impressionante show equestre, repleto de truques destemidos e corridas de carros de alta velocidade. Sua excursão será concluída com o transporte de volta ao seu hotel em Budapeste. This was our favorite tour in Hungary. The Palace tour was quick but really covered all we would want to see. The farm was wonderful and the horse show truly amazing. We had plenty of time to look around. Don't miss this great day trip. the Palace was amazing and our guide was brilliant - full of fun facts about the Hapsburgs. Horse show was just o.k. Netter Reisebegleiter mit guten Deutschkenntnissen. Allerdings bereits sehr alt und deshalb unsichere Fahrweise. Kein Navigationsgerät bzw. Landkarte dabei, deshalb mehrfach Probleme mit der Ortskenntnis. Gute Geschichtskenntnisse. Programm planmäßig wie vorab geschildert. I had a 5-hour tour along with another American couple with our guide Marta to Godollo. Marta is simply fantastic, a living history book of Hungary. She was the driver/guide. On the way out of the city, she pointed out so many interesting buildings and told so many stories. Then we got stories about the Soviet era in Hungary before the fall of Berlin Wall and her personal experience in this terrible time. Once we were inside the castle, she had an interesting story on almost every ordinary looking object that I would normally quickly walk passing by. I learned so much about Sissi's life and Hungarian history in general from her. Afterwards we had a very entertaining local horse show 10 mins down the road don't miss this one either. I absolutely enjoyed my time with Marta. She is so caring and considerate that she offers additional/essential information other tour guide wouldn't bother to tell. Thanks a lot Marta! What a very pleasant way to spend 5/6 hours in Budapest. I thoroughly enjoyed this outing. I was collected by a taxi at my hotel and driven in to town to meet our guide for the day. There was only two of us on this trip. Myself and another young lady named Megan from the USA. Our guide/driver was Marta and she was wonderful. She was such a nice, kind lady. Her knowledge of local history and storytelling was wonderful. The tour of the Palace was interesting and very informative. We had time to sit enjoy a cuppa and a slice of traditional cake which was yummy! Onward to the Horse Show. This was again great to see. The horsemanship and show was magnificent. We also got to taste a local drink down the hatch in one!!... and a traditional savoury scone. We then toured the stables and a museum. Marta then, very kindly dropped us off wherever we wanted. I would highly recommend this tour. This tour was well worth the visit but spoilt by bad pick up arrangements and not enough time given to the palace visit before dashing off to the farm visit. Also a little time for refreshments would have been nice at the fatm trip. Would be worth doing both as seperate trips for more time at each. After several phone calls thanks to the concierge at the Marriott Hotel and when they rang the local number, as provided on the documentation, they were given another number to ring etc, once over that problem transport did arrive at the hotel and eventually we left on the tour. The tour guide took us through Godollo Palace but it was rushed at the end due to time constraints. The traditional Farm Trip with Horse Show and Carriage was entertaining. The documentation stated that we would be dropped back to our hotel but this was not the case and we were dropped back in the middle of the city centre and left to find our own way back to our hotel.